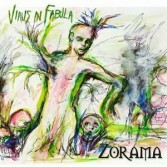 " Virus in fabula”: fourth record of the Neapolitan singer-songwriter, also known for having given to the great Mina the recent astonishing single "Il Tuo Arredamento", extracted from "Maeba" (PDU - Sony Music) and which contributed to the achievement of the gold record with FIMI certification. "Virus in fabula", which presents an astonishing and disturbing and amazing cover art designed by the painter and sculptor Prisco De Vivo, will thus see the light six years after the previous album of unpublished "Involitudine", and will contain 12 long-lasting tracks - in perfect contrast and with extreme courage - ranging from progressive to psychedelic, wedging through a complex, committed, articulate and well-rooted songwriting script. The single "Munch" was released on May 18th with much of video clips by the French director Marc Sabat and entered the ranking at 30. of Itunes's top 200 alternatives.